Since this is an Austerity Drinking Tour, walking, public transport, and home-stays have helped us save money for drinking. Free tastings at Nantes’ Maison des Vins de Loire helped us visit over twenty wineries that only a pricy rental car could. Of those, three came home with us. We will taste each this Monday, Tuesday, and Wednesday: so check back! Codified only in 2009, SPND is a subset of Saumur and devoted to youthful, spicier, fruitier Cabernet Franc. Its chalkier soil drains and strains vines better than the larger, clay-rich Saumur: fewer, riper grapes = more concentrated wines. APPEARANCE: It looks clear, but inky purple, no watery rim and medium legs. AROMAS: Developing but notable aromas of supremely ripe black cherry and cinnamon show off. PALATE: The dry palate is sharpened by higher acids and chunky, chalky tannins. The body and 13.5% alcohol feel mid-weight. FLAVORS: Miniscule, 40 hectoliter yields concentrated flavors of black cherry, olive tapenade, and a chalk, mineral finish of medium plus length. 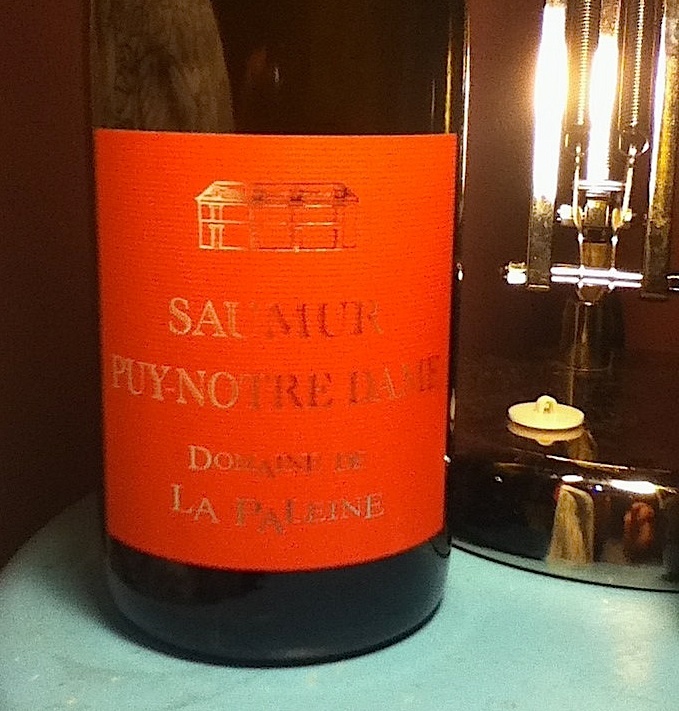 CONCLUSION: Paleine’s SPND is very good quality (4 of 5) and shows promise for this new AOC. A few more years of aging won’t hurt it either (EU 9.80). Pop in tomorrow (Tuesday) for another winning wine from the Loire, as we wrap up this fantastic region. This entry was posted in Uncategorized and tagged Anjou, Cabernet Franc, chenin blanc, France, Loire, Moulin de Chauvigné, Saumur Puy-Notre-Dame, Savenniéres, wine. Bookmark the permalink.